72-080 Donated Birds Pt.IV Japanese Army Aircraft with Patriotism Inscriptions "Aikoku"
72-079 Donated Birds Pt.III Japanese Navy Aircraft with Patriotism Inscriptions "Houkoku"
Bf 109G-4, Werk. Nr. unknown, captured by 1 Sq SAAF at Gerbini, Sicily, July 1943, nicknamed "Jack"
Nakajima-Nieuport 29 C.1 (typ Ko-4) "660"
Nakajima-Nieuport 29 C.1 (typ Ko-4) "934"
Spad XIII C.1 (typ Hei 1) "18970"
Nakajima-Nieuport 24 C.1 (typ Ko-3) "1082"
Nakajima-Nieuport 24 C.1 (typ Ko-3) "23"
72-054 B-25 "Finito Benito - Next Hirohoto"
72-038 Donated Birds II Aircraft with "Aikoku"
72-029 Donated Birds Aircraft with "Houkoku"
72-020 Japanese ZOO Part II. 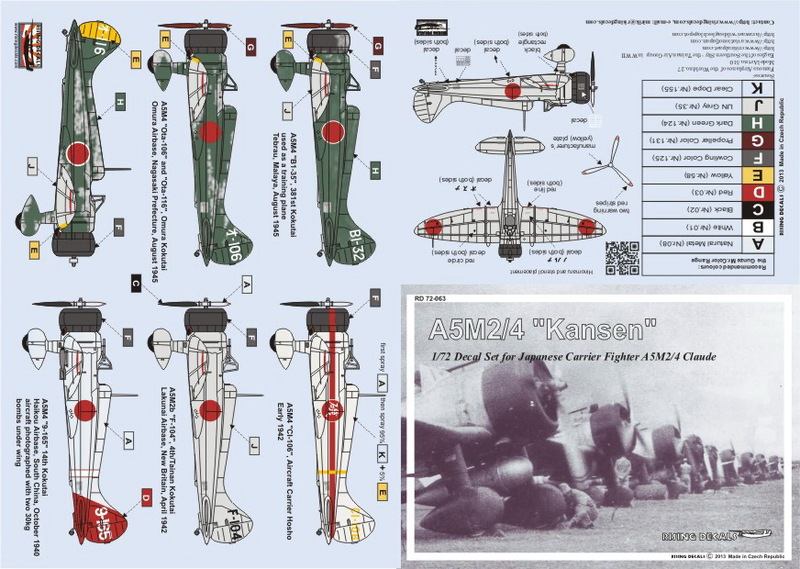 Includes 11 camouflage schemes for A6M2/5, B6N2, D4Y3, J2M3 and N1K1-J.